Ripe For Revival – 1931 Edition | THAT'S ENTERTAINMENT! So far we’ve covered Whoopee! (1928), Sweet Adeline (1929), and The New Yorkers (1930). But before I introduce today’s featured musical, I must mention that the best and most notable show of 1931 is the Gershwins’ Of Thee I Sing, a political satire that earned the distinction of being the first Pulitzer Prize winning musical. But as I mentioned in previous Gershwin posts, Of Thee I Sing still gets played often enough, and its historical relevance will never keep it as far away from modern theatergoers as some of the other titles featured on this blog. Essentially, I am confidant that Of Thee I Sing will be seen again. So today I want to feature another forgotten 1931 gem — one that is equally deserving of our attention. The Band Wagon is notable for a variety of reasons. For starters, it’s the first show we’re covering on That’s Entertainment! that’s NOT a traditional book musical. (Simply put, it has no fluid plot.) It’s a musical revue! Though the concept isn’t completely foreign to today’s theatergoers, the musical revue isn’t nearly as popular as it was 90 years ago. It’s a shame too — because revues also contain the two ingredients necessary for any musical comedy: music and comedy. Fans of classic television will recall the bygone era of the variety show: a little music, a little comedy, and a couple of big stars. That’s what The Band Wagon had. And that’s all that it needs to survive today. The Band Wagon starred Fred Astaire and his sister/dancing partner, Adele, along with Helen Broderick, a musical comedy star of the era, Frank Morgan, a comedian best known as The Wizard in MGM’s 1939 adaptation of The Wizard of Oz, and Tilly Losch, an attractive Austrian dancer. The score featured music by Arthur Schwartz and lyrics by Howard Dietz, and the sketches were written by Dietz and George S. Kaufman. 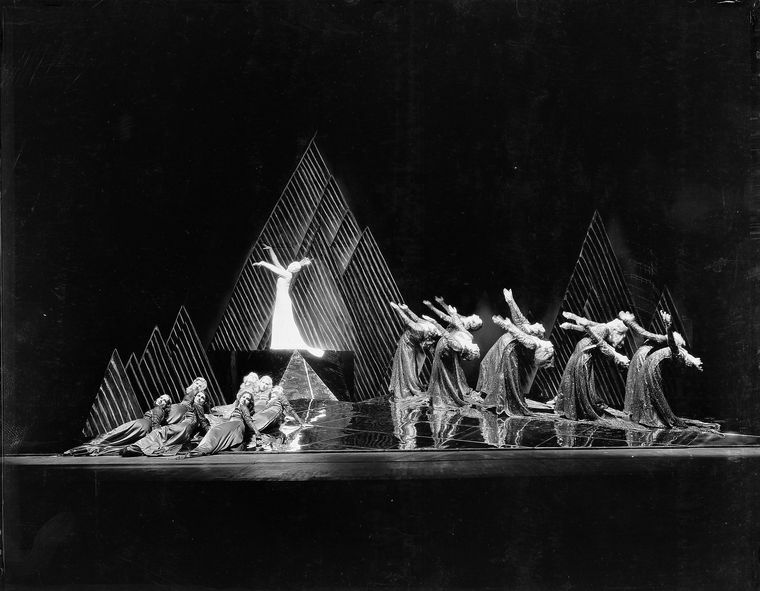 The show was produced by Max Gordon, with staging and lighting by Hassard Short, choreography by Albertina Rasch, and scenic design by Albert R. Johnson. But even with all those names in the program, the true star of The Band Wagon was an innovation known as the double revolving stage. The double revolving stage is just as it sounds: a stage consisting of two rotating platforms. In this case, a larger one and a smaller one — each with the ability to move in opposite directions. (Think of a Busby Berkeley number.) 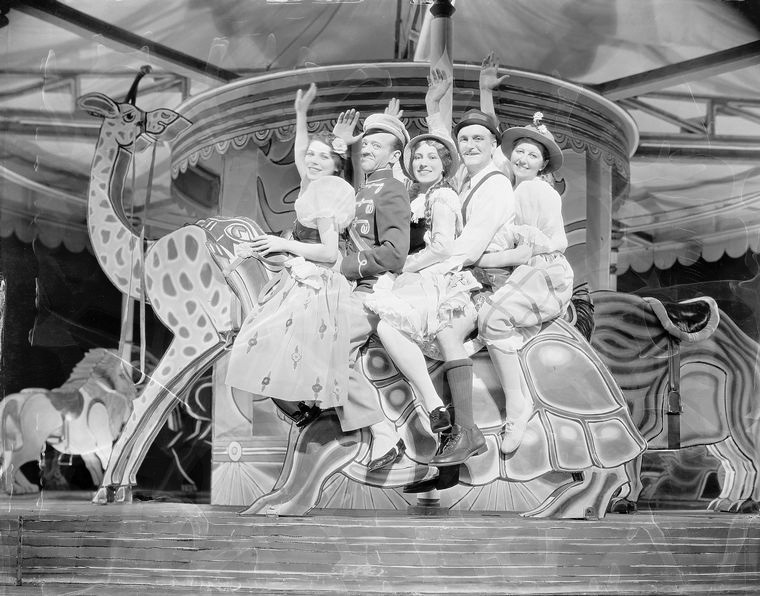 This was a novelty in 1931, and though the single revolving stage was pioneered in the ’20s, The Band Wagon took the innovation and gave it a new spin. (Pun intended.) The resulting stage pictures were apparently breathtaking. The effect was perhaps most striking in the show’s most famous number, “Dancing In The Dark,” which was sung by featured singer John Barker and danced by Losch and the girls on a raked mirror floor (accompanied by thrilling changes in light). 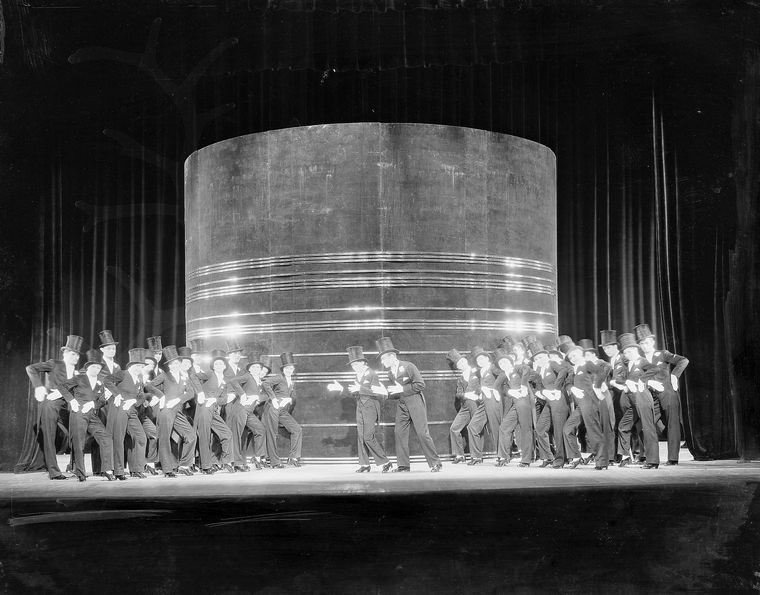 Other numbers to make great use of the revolving stage were “The Beggar Waltz,” a dream dance between Fred Astaire as a homeless man and Tilly Losch as a star ballerina, “Hoops,” a duet with the Astaire children as naughty (but observant) schoolchildren, and the exhilarating first act finale, “I Love Louisa,” performed on a Bavarian merry-go-round by the Astaires and company. Before highlighting more of the incredibly fun and melodic numbers, I must make mention of the sketches, which in a musical revue, is of equal importance to the score. The sketches in The Band Wagon were considered by critics as some of the absolute best. The then-favorite was “The Pride of the Claghornes,” a parody about a Southern family whose dignity is jeopardized when it is learned that their engaged daughter (Astaire) is STILL a virgin. Other sketches include a murder mystery parody involving Morgan as a detective, a lampoon of college shows with history champs instead of football stars, and an odd sketch called “Pour le Bain,” in which a British matron shops for bathroom fixtures. In a 2001 concert production, the sketches were fairly well-received. But even the score was funny. 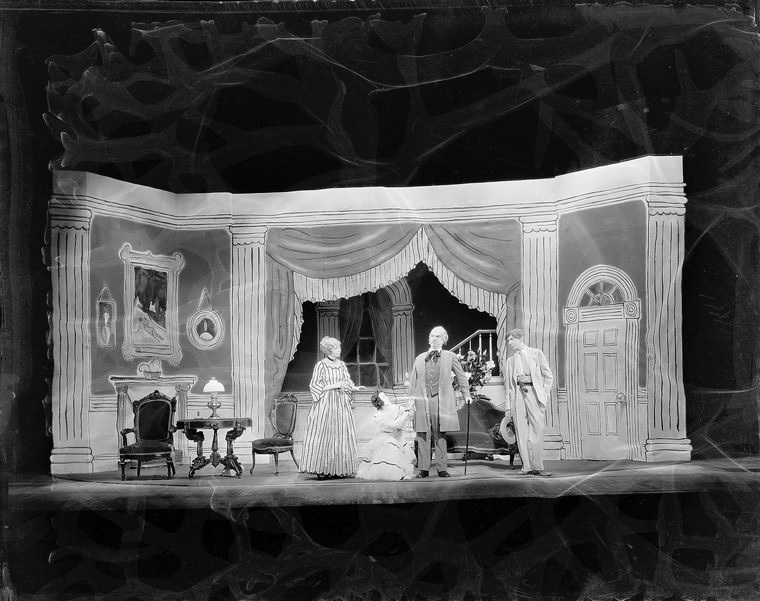 The audience entered to find the curtain raised and the company dressed in formal wear, slowly filing in and taking seats on the stage as if they too were seeing a show. As the lights dimmed, they began the opening number, “As Others See Us (It Better Be Good),” which demanded that the new show be good, funny, and worth the money! Then the set revolved and the audience was treated to a ten-minute send-up of conventional revues filled with gags and clichés. Such self-awarness was refreshing. In addition to the numbers mentioned above, the Astaires duetted on “Sweet Music,” as Fred played the accordion and danced with Adele. Fred also got a solo turn in the soaring “New Sun In The Sky,” while Adele teamed up with Frank Morgan for the impish “Miserable With You.” The siblings reunited for the 11 o’clock spot, the sizzling “White Heat,” which both brother and sister performed in white tie and tails. And the Astaires joined with the rest of the stars for the the rousing “Five Star Finale.” Though the duo clearly headlined the revue, the other cast members were given material of equal quality. In addition to “Dancing In The Dark” and “The Beggar Waltz,” Losch dazzled the audience with her solo dancing in “The Flag.” Funny man Morgan and a few male members of the ensemble sang a mock romantic ode to an unseen “Nanette.” Helen Broderick got a comic turn in the brilliantly melodic, “Where Can He Be?” in which she pined for an ideal mate, all the while surrounded by the entire male chorus. Meanwhile, featured singer John Barker joined Roberta Robinson in the equally ear-pleasing “High and Low,” and even the ensemble got the chance to shine in a witty ditty called, “Confession.” Each number is Schwartz at his most excellent. Okay, so we know now it has a great score. And if it’s not funny by itself, it could be made funny — the sketches can either be rewritten or replaced. Truthfully, selling the show today, as was the case in 1931, would simply require stars. But finding celebrities for this show might be particularly tricky. Some performers might be turned off by the fact that a musical revue would not allow them to play a single contained character and story. But if there WERE stars interested in mounting a classic revue, this should be at the top of their list. It’s truly one of the best of the genre. (However, that means very little to the uninformed public.) To an audience largely unfamiliar with Schwartz and Dietz, money-making stars are vital. 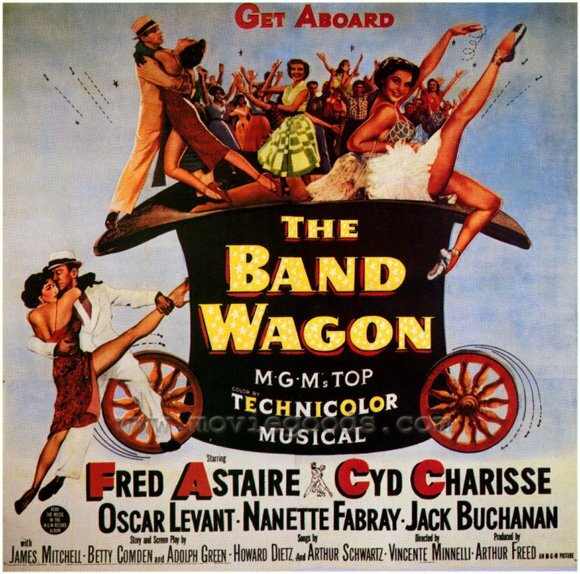 However, the biggest obstacle in mounting a revival of The Band Wagon is the existence of a wonderful MGM spectacle, also called The Band Wagon (1953), that stars Fred Astaire and features a majority of the stage production’s best numbers. Of course, it’s nothing like the show, with an added “backstage” plot about Astaire’s character’s comeback. Several other Schwartz-Deitz tunes were added, including “I Guess I’ll Have To Change My Plan” [from The Little Show (1929)], “Shine On Your Shoes” [from Flying Colors (1932)], and “You and the Night and the Music” [from Revenge With Music (1934)]. A new song was also added, “That’s Entertainment!” — a show-stopping anthem to show business, from which this blog takes its name. However, with audiences relating the title, The Band Wagon, to the 1953 film, they’ll not only expect the story, they’ll also expect some of the added numbers. Certainly any of those songs could seamlessly be fitted to the ’31 Band Wagon, since it IS a revue. But does the story have to come with it? If so, we’re robbed of the sketches and the other brilliant numbers NOT included in the film — “Confession,” “Where Can He Be?” and “White Heat,” to name a few. The Band Wagon is truly an excellent film. In fact, attempts have been made to turn the film into a stage play, with the last incarnation titled Dancing In The Dark. In actuality, I think the two properties could both work on stage, but I’d personally recommend that adaptations of the film stick with the title, The Band Wagon, for the audience’s sake, and this, the 1931 show, adopt the new title, Dancing In The Dark. With all the same numbers and sketches as in ’31, the only difference would be that people wouldn’t come in expecting the movie. Because the simple fact remains: 1931’s The Band Wagon deserves to be revisited — double revolving stage and all — no matter what it’s called. 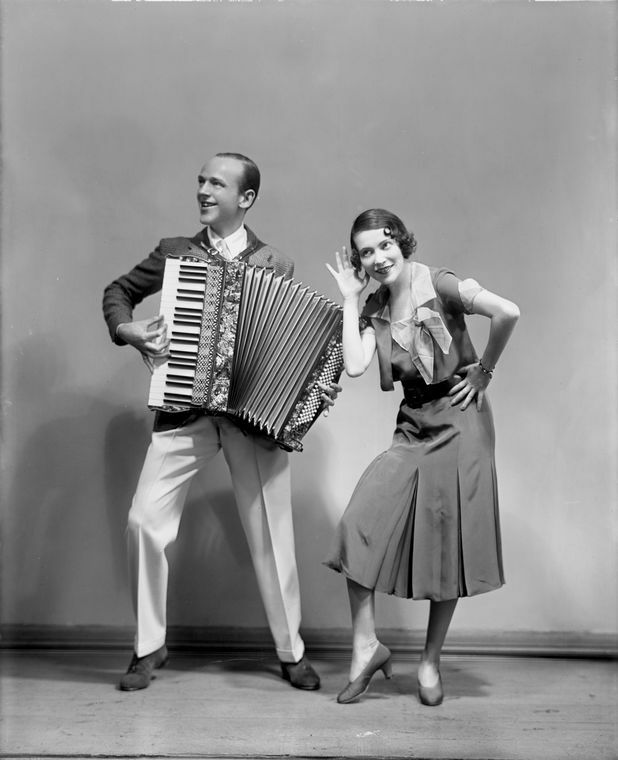 ETA: In 1931, RCA Victor pressed a two-sided record cut at 331⁄3 RPM of The Band Wagon score featuring Fred and Adele Astaire. Though incomplete, many historians consider it the first Original Broadway Cast Recording. (However, Original Cast selections of London shows had been recorded for over a decade.) Contact me privately if interested in these wonderful recordings. Come back next Monday for a 1932 show that’s Ripe For Revival! And tune in tomorrow for the best Honeymooners‘ sketches from 1954-1955 and 1956-1957! Great blog. 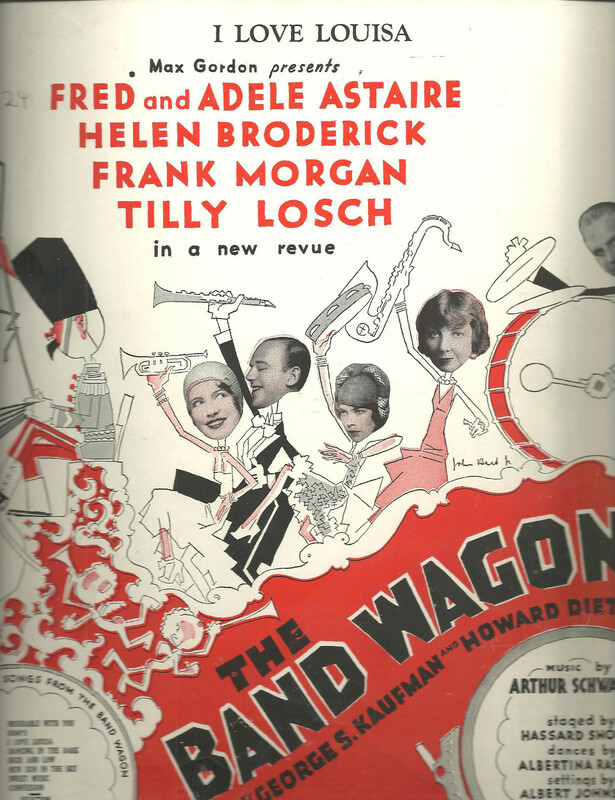 Also especially wonderful to see dear old Tilly Losch feature here alongside Fred and Adele Astaire in their most famous partnership from the great musical BandWaggon of 1931. It’s a tantilizing what might have been if Fred and Tilly had danced together again in the years that followed. Perhaps Tilly would have been better remembered and cherished as being such a unique dancer . As it was Tilly’s friendship with Adele proved one of the most enduring and close especially at times of adversity for both of them in the 1930s and 1940s. Hi, William! Thanks for reading and commenting. Certainly a great show with an even greater cast. Look for more of the Astaires here in a few months.